An audio and visual expression of who streaming music listeners are and what they do, understood by the brand Spotify. 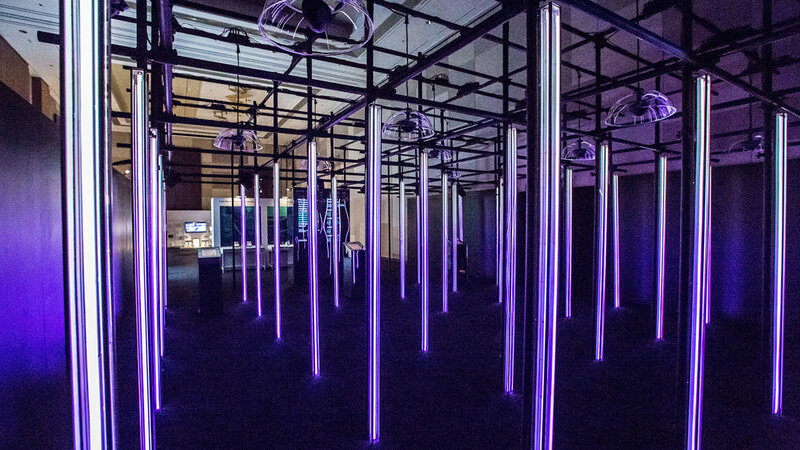 In 2017, Spotify's CES booth inspired visitors with an experiential educational journey into the power of audio and music streamer's behaviors. 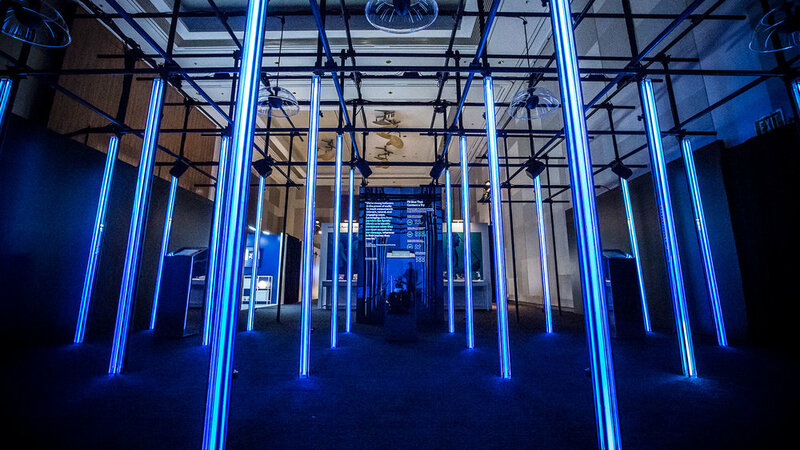 The installation introduced guests to an immersive forest of light pillars ripe with visuals and sounds kin to the experiential moments that music has in our everyday lives. CES guests were able to meander through the experience and find interactive kiosks where music streamer data is explained through a collection of data infographics. The concept foundation for Spotify CES was rooted in the pain points of how to best address an audience at CES. Many brands often show up to conventions like CES with a powerful yet complicated message. These messages are often dry for audience members to connect right off the bat. The goal for the Spotify CES booth was to first engage visitors with an immersive experience that builds excitement around the brand. With a more engaging experience upfront, Spotify is able to begin introducing the power of data and analytics that have made the brand a leader in consumer analytics. Following the more emotional experience of Spotify, the brand is able to lead conversations on particular products that may be relevant to different potential partners. Providing an environment to facilitate different size and types of conversations with potential partners is important for the second portion of the user experience flow. An experience map outlining the type of spatial programing and storytelling required at any particular point in the conceptual experience flow. A newly released white paper by Spotify titled, 'The Power of Audio,' was a study focusing on the importance of sound in developing memories. Music is only one form of sound found to help in aiding the creation of memories and the connection they have to each person emotionally. The introductory experience at CES was designed to take visitors and potential partners through a sound journey of four different Spotify moments. A collection of environmental sounds plays through directional audio speakers - As guests walk through an experience of visual spectacle, environmental sounds begin to inform visitors about which moment they are in. As the guest continue deeper into the experience, artist tracks that are relevant to the Spotify moment begin to fade in. At the end of the sound journey, interactive data plinths allow guests to learn how varying demographics of Spotify listeners interact with music in each moment. The Forest of light pillars showcase animations specific to one moment at a time. Animations within the light forest are unique to emotional feeling of each moment as well as tied directly to beat of the music playing. The length of each moment is determined either by the length of playing through a single song or manually changed through a touch interface by Spotify brand ambassadors. Adjacent to the communal lounge, a photo booth allows visitors to share a gif of them in their choice of Moment filter - Chill, Party, Commute, and Workout.